Woot, made it back to Brooklyn safe and sound. All and all it was a most enjoyable trip. Lots of great bars and restaurants and, I hear, great museums and stuff too. I will be taking a few days off to recuperate and catch up on things and then on Monday it is Bar Man's and the Mysterious Chinese Woman's anniversary. I figured I better take that day off seeing as how I missed Valentine's Day this year while slurping down margaritas in Mexican Radio. Well, sad to say, it wasn’t that big of a fling. I did go out during the day and hit a few bars but was planning on making an evening of it after dinner. I particularly wanted to hit a bunch of the Cave Bars I had been hearing so much about an The Mysterious Chinese Woman had said she wanted to visit them as well. By the time evening rolled around and we had finished eating at a place not far from our hotel it had started to drizzle and had turned a bit chilly. MCW had still not fully recovered from yesterday so, alas, we decided to call it an early evening and just headed home. I did hit a few places earlier in the day though. The streets seemed awfully quiet today and not much was opened. 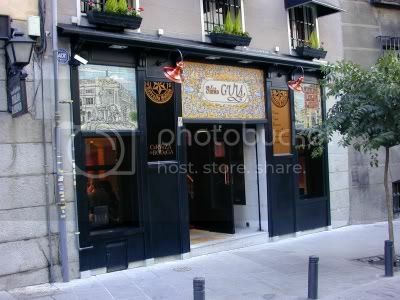 I headed back to where we had dinner the previous night, fairly close to Plaza Mayor, and only found this place open at a bit after noon. The place was fairly crowded though, maybe because it was the only place open. Last night this whole area was really hopping. This place had a white marble topped bar with a wood and brick front and a brick foot rest. There are dark wooden bar chairs. A wide inverted U shaped beer station on the bar has four spigots. 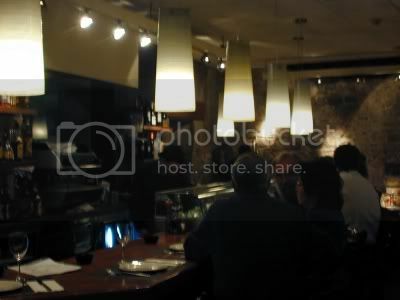 Copper colored lights shaped like wide bottomed pawns from a huge chess set hung over the bar and over the few small marble topped tables with chairs in here. A large copper bucket on the bar holds an assortment of wine bottles. The back of bar is a brick wall with a large copper colored relief of the bars name. On one side of the name is a wine rack full of bottles and on the other is a small shelf with liquor on one level and a couple of small coffee grinders, a miniature bull, and statues of Don Quixote and Pancho on the other. There are three large copper vats on wooden racks opposite the bar. They look like brewing tanks but from where they are positioned I suspect they are just for show. They look like the real McCoy though. My friend Bruce would love to have one of them, I am sure. A Mexican bar and restaurant that proudly proclaims “Hemmingway Never Ate Here…” It is right next to the Belgian bar that I had visited previously. 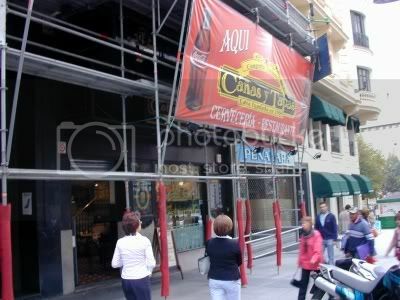 Kind of interesting that you have a Mexican place next to a Belgian bar in Spain. Kind of like something you would find in New York. 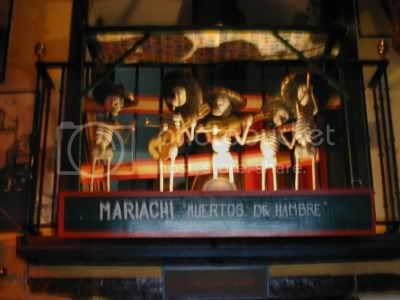 This place comes complete with a large display of a skeletal mariachi band. My friend, Gary, would like this place. He collects miniature versions of these. They also have a ceiling covered with sombreros in various colors and sizes with a few old military helmets thrown in for good measure. The bar area is very small but the bar is a nice wooden bar with a shiny copper covered top. Standing only though with a brass rail. The lower portion of the walls are granite looking ceramic tiles and above they are painted a mustard yellow. All available space is taken up with photos of Old Mexico and there are a few of my old friend Zapata. Haven’t see much of him since my stay in Mexico. There is an old wooden cupboard behind the bar that holds liquor and glasses. They have one of the larger selections of tequila that I have seen so far in Spain, but that is only about eight bottles. They have a couple of hams and sausages hanging by the window but, I am sad to say, they are fake and only for decoration. They do serve Mexican food, or at least what passes for it. I should have tried some just to see what it was like. 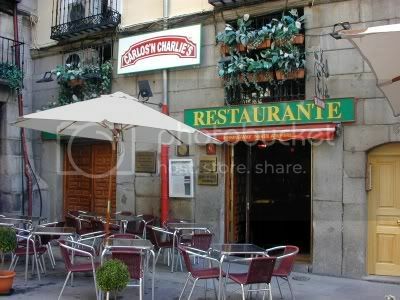 There are a few tables with chairs under a large umbrella out front and it looks like that is the only place that you could sit and have a drink and a bite to eat here. The people running the bar were very friendly. I got a small piece of candy instead of a tapa with my drink. I guess they just don’t have tapas in here. I also found out that the reason that almost everything was opening late today and it was so busy last night is that this is a big national holiday. It must have been big because when I was in Madrid last week they were already setting up grandstands for what must have been a big parade (I must have slept through it). I had a glass of beer. 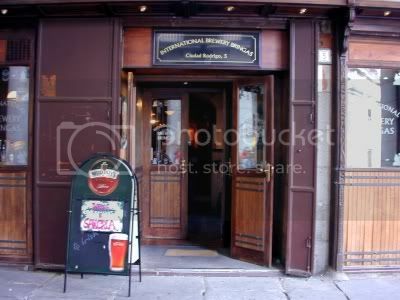 Also known as International Brewing Bringas, this is an Irish tapas bar. Well, not completely. They just have a small shelf of them, probably to satisfy some legal requirement. This was a pretty nice place with an old wooden bar and bar stools but, alas, no brass rail. Each of the four types of the beer that they had on draft had its own beer spigot provided by the distributor. The lower half of the walls were wood paneling and the upper half kind of a caramel colored plaster. A dark wood set of shelves was built into the wall behind the bar and it held a selection of liquor and ceramic mugs. Even the Irish bars have an espresso machine. They have an old copper still on display and old photos of trolleys, cars, and some kind of a huge control room replete with levers, dials, and who knows what else on the walls. I have no idea what it was supposed to be, and neither did the bartender. Maybe it has something to do with a distillery though because, on the wall behind the bar is a painting, in black, of the inside of one. I don’t think so though. 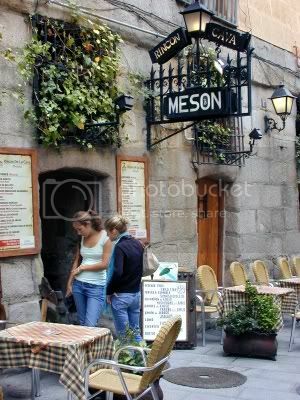 This is the most authentic looking, if not the only, Irish bar that I have seen in Madrid. 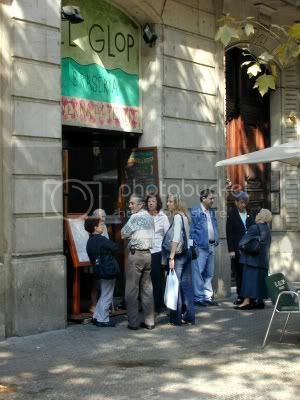 Paddy’s Lane in Barcelona had it beat by a long shot though, they even had real Irish bartenders. I had a pint of Murphy’s Irish Red. This is one of the many, but the first that I have been to , Cave Bars that I keep hearing so much about. They do have the appearance of a cave, or at least of a dungeon. All brick and iron in here with heavy wooden tables and benches. Yes, most certainly a dungeon. Iron chains hang from the archways that separate the small rooms and the lighting fixtures look like torches. The bar has a heavy wooden top with a brick and wood front. The foot rest is wood and old stone. The floor is flagstone. High arched brick ceilings are just a continuation of the old brick walls. I don’t know if all of these bars are the same, but this one seems to be an endless warren of stairways and rooms. There is a large ironwork piece over the bar that looks like it could be the railing of a balcony. Hanging from it are numerous ceramic pitchers and mugs. The bar back is just an arched entryway into the kitchen area. All kinds of medieval looking paintings on wood adorn the walls and there are similar paintings directly on the few areas of the walls where there is exposed plaster. It is a bit like having a drink on an old monastery or in your sub-basement, if you owned a castle. More like in Dracula’s sub-basement. Very interesting though and it is a bit too bad that I didn’t get a chance to visit a few more tonight with the Mysterious Chinese Woman. There are a whole bunch of them along this stretch, part of which is named Cava de San Miguel. I had a glass of Cava, it seemed somehow appropriate. Well, not too bad for my last day, all things considered. Four bars today making 878 for the year and leaving 122 to go. Tomorrow will be the flight home and I plan on taking a few days off just to catch up on things and recover from jet lag. Today was another transition day so it was, from a bar-hopping perspective, pretty slow. I didn’t really have the time, nor inclination, to have a drink before heading to the train and the trains station here, unlike the one in Madrid, didn’t really have much to offer in the way of drinking establishments. I figured I would just wait until my trip was over. 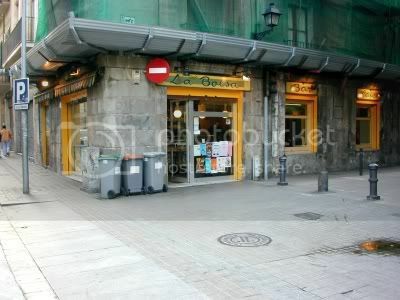 This place was pretty close to our hotel in Madrid and one of the few in the neighborhood I hadn’t been to yet. The name sounded familiar though and I did see where I had been to another by the same name. That, and the similar interiors, leads me to the conclusion that it is part of a chain of some sort. Maybe a Spanish version of TGIF’s. There is a long white marble topped bar with a few zigs and zags to it. The front is dark wood panels with fairly ornate designs on them. There are silver foot rails and just plain wooden bar chairs. Two beer stations on the bar, one at each end. They each have three spigots and have that enclosure with the plastic front around them that holds the beer glasses. The globe lights with black plate-like shades are mounted on those pulley-like devices and hang at varying heights. I guess a lot of people, like Bar Man, like to play with them to make sure they really work. The bar back is dark wood wit distressed mirrors and chalkboards mounted on it. The chalkboards list the tapas selection as well as their wines. The mirrors have glass shelves mounted in front of them and they hold the wine and liquor and a display of their bottled beer. There are three (the other place only had two) of those huge beer containers hanging from the ceiling. I can’t even imagine how much beer they must hold but it certainly makes you wonder how fresh the stuff you are drinking must be. The floor is large dark red and small white tiles. A marble staircase heads up somewhere and there are a lot of little tables with white marble tops and wooden chairs and stools filling up the downstairs area. Photos of old Madrid and miniature bull fighting posters hang on the wall along with a framed collection of colorful ticket stubs from bull fights. I had a glass of San Miguel and a plate of olives and cocktail onions (I am definitely back in Madrid). Only one bar today. It was a bit of a long day and after we got done with dinner the Mysterious Chinese Woman was a bit off her feed. She didn’t even feel like poofing so we ended up taking a cab back to the hotel. Well, I still have hit 874 so far this year leaving 126 to go. Making 875 before leaving Spain is going to be a slam dunk. This is my last full day in Barcelona so I have a lot to see and do, without overdoing it. Maybe hit a few bars in the morning, have an early dinner, then hit a few more after. 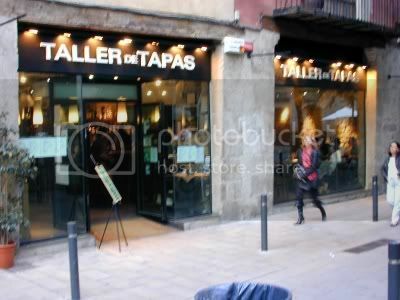 A fairly typical tapas bar but with way more dried hams than normal, at least 50 or 60. And they hang just inches above your head as you sit at the long wooden bar, complete with a brass rail. The hams are illuminated by little spot lights (they must be very proud of them) and just behind the hams hang globe lights with flat black shades. These illuminate the bar. The bar stools have a black metal base and round black seats that sit on a wooden column with a metal ring for your feet. 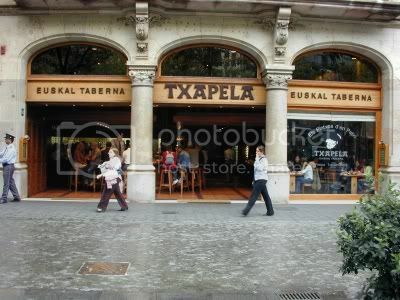 Most of the rear surface of the bar is covered by tapas, kind of Madrid style. 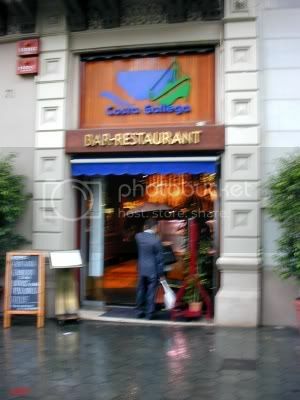 At one end of the bar is a large copper bowl filled with ice and bottles of wine and Cava, the Spanish Champaign. The wall behind the bar is wood paneling with a large mirror on one side and metal, industrial looking shelves on the other. The shelves hold the liquor and wine. Underneath them are metal cabinets and drawers and more shelves with glasses. The wall opposite the bar is a large mirror with what looks to be a clown holding a beer etched onto it. Just down the street a few doors I ducked into this place to get out of a chilly drizzle that was beginning to fall. The top of the bar was heavy wood and the metal foot rail was silver. Just one beer spigot on top of the bar. The front of the bar was white glass that was frosted to look like marble. It was illuminated by lights under the overhang of the top of the bar. The bar stools were square with metal legs and thick, block-like pink seats. Nice red domed lights hung over the bar. The bar back was metal shelving with liquor on the top shelf and an espresso machine, cups, saucers, and glasses down below. The floor and the wall opposite the bar were gray blocks. There was a decent sized eating area in the back. A large place with the wide windows in front largely open to the busy street. Tables and booths line the walls and a large U shaped wooden bar sits in the middle. There is a brass rail. The back portion is covered in tapas in their cases. The wooden bar chairs have round red seats. The center area of the bar houses the busy wait staff and the center island that holds mostly tiered wooden shelves of wine. There are also four, industrial strength, cork pullers so they must serve a lot of wine. In the center of the bottles of wine is a large oval shaped keg with spigots on each end from which they fill their carafes. A cute little place that stare you in the face when you get off the Metro at Jaumel. More intimate than most with an L shaped bar that has one case of tapas. The top of the bar is a hard acrylic that looks like mustard sprinkled with pepper. The sides are paneled with wood and there is no foot rest or rail. The bar is ringed by wooden bar stool. The wall behind the long side of the bar and the back wall are wooden shelves filled with wine bottles. There is jus a narrow panel of rose colored paint that matches the other two walls between the shelves. The ceiling is kind of a corrugated looking dark orange. The two rose colored walls have smaller cabinets filled with wine bottles. A large round chandelier with pink and yellow and white pinecone shaped lights hangs from the ceiling. Similarly shaped lights hang on the walls as well. There are benches and tables against the walls and small tables with chairs taking up the rest of the floor. The floor is pale yellow tile. 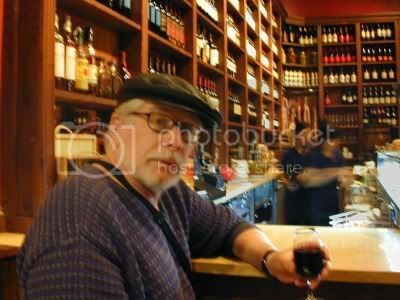 The place was packed with a very lively crowd and I had a glass of red wine. This is kind of a small, New York East Village kind of a bar down a small side street. The bar has a wavy thick wooden top and a green cement front with diamond dust embedded in it to make it sparkle. The window casements match the front of the bar. The wall behind the bar is desert rose with a fancy mirror hanging on it. A set of wooden shelves and a narrow cupboard in almost a rustic French style holds the liquor and glasses. There is also an espresso machine. Not a tapa or ham in sight but there is a large bouquet of flowers on one end of the bar and a translucent beer spigot illuminated from within by light that changed colors at the other. Lots of little candles sit on top of the bar as well. They advertise themselves as a cocktail bar and that is what most of the crowd was drinking. The bartenders were shaking and muddling up a storm. Not to many locals in here unless they are ex-pats because English seems to be the most prevalent language with a bit of German thrown in for good measure. Almost an Asian style pale yellow wallpaper decorated with prints of birds and flowers in grayish blue and black cover the walls. Light bulbs with orange rippled glass shades hang from the ceiling and on the walls. A small, kind of dark, chandelier hangs in the middle of the room. Plush black banquettes and red and black hassocks around small tables fill up the rest of this crowded bar. I went against the trend and had a glass of beer. After taking the Metro back to the stop by our hotel we headed to this nearby place that I wanted to try just because I liked the name. The bar has a stainless steel top. The bar stools have somewhat worn black bucket seats. There is a steel cabinet behind the bar that holds oranges, soda, and an assortment of wine, beer, and liquor. There is also a large espresso machine. And wooden shelves holding more liquor. Several hams and dried sausages hang behind the bar. There is but a single beer spigot. Kind of no nonsense spotlights overhead. The floor is brown tile and the ceiling is painted a light blue in an attempt to brighten up this otherwise somewhat dingy place. The walls are brown paneling. There is a slot machine and a cigarette machine pushed up against the wall and a television mounted on the wall near the door. You have to turn around from the bar to watch it. In the back are chairs and tables with white tablecloths and there are a couple of tables and chairs on the sidewalk in front. Not a bad place, but not overly cheerful either. I had a brandy and an espresso before heading on back to the hotel. A decent enough day with six bars hit bringing the total up to 873 for the year and leaving 127 to go. 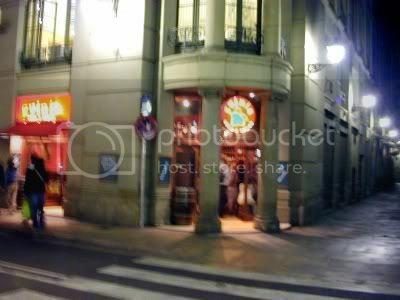 Tomorrow I head back to Madrid so I doubt if I will be hitting too many bars given that I will have a long train ride. The Mysterious Chinese Woman and her Mysterious Sister decided to visit some museums today so I just wandered around a bit on my own. I went with them as far as the general area that they wanted to visit and had a bit of lunch with them before setting out on my own. I just couldn’t resist the name of this place, I had to stop in. It had a long bar with a heavy wooden planked top and a wooden front with square patterns on it. There was a silver foot rail and light wooden chairs. There is a copper colored beer station on the bar with six faucet like spigots with black handles. There is fairly elaborate shelving behind the bar with four sections. Three of the sections have mirrored backs but the one behind the espresso machine is backed with wood. A pretty decent selection of liquors along with glasses fill the shelves. To the left of the shelves is a section of bright red ceramic tiles with another four spigots protruding from it. It looked like they were pouring sangria out of these. Three huge light fixtures hang over the bar from the ornate wood ceiling with large diamond shaped sections above each light. These sections look like a decoupage of old newspapers. The light fixtures look like inverted umbrellas with ezch section a translucent panel that is rounded at the top. Each section is defined by a narrow metal band and at the top, between each section, hangs a small lamp with a glass shade. Twelve lamps in all on each fixture. The walls are a dusty rose with a border of smeary turquoise pant above wood paneling. The border is decorated with paintings of cups, teapots, pitchers, bottles, and fruit. In the back is a dining area separated from the bar by the open kitchen. A large circular rack above the kitchen has hams and sausages hanging from them. There is a fairly large outdoor area as well. This is a large place with high ceilings. 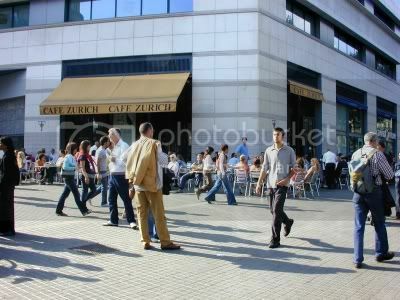 A very noisy place on a major square in the heart of the fashionable shopping district. 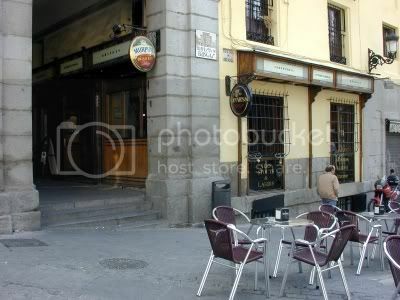 The square is Plaza Cataluna and it seems to be a very popular place to just hang out. The bar itself is dark wood and fairly small, just a stand-up place with a thick silver foot rail. Lamps with large orange fabric covered shades hang from the ceiling and smaller versions hang from the sides of pillars in the dining area. There is an upstairs dining area that is kind of a balcony hanging over half of the bar and restaurant. This makes the ceiling lower in that area of the place. The bar back is mostly glass shelves mounted on the pale yellow wall and a couple of espresso machines and a juice squeezer, the kind where you load a bunch of oranges into the top. The area behind the bar that has the higher ceiling has a large mirror mounted on the wall. 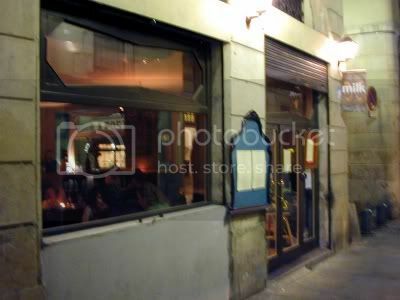 Large French doors on two sides let you gaze out at the square and busy street and at the people who chose to sit out there and have a drink. I had a bottle of San Miguel. I headed back to the area where I was going to be having dinner with the Mysterious Chinese Woman and her Mysterious Sister. Our meeting spot was going to be Paddy’s Lane where I was at the other day. I decided to wander around a bit and ended up in some back streets with a lot of graffiti covered walls. 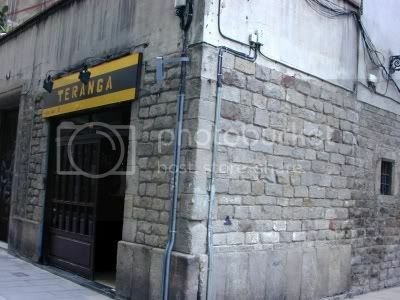 I also found Teranga, just a little hole in the wall. The people in there were all from Nigeria or some such place and they seemed to be a bit bemused when I wandered in. They were even more bemused when I decided to stay and have a drink. I got the distinct feeling they didn’t get many tourists in here. The bartender spoke English fairly well so we chatted a bit and she tried to explain how to find my way out of the warren of streets I had gotten into and get back to Paddy’s Lane. It wasn’t that hard to do actually. This was just a very small bar without much in the way of decorations. 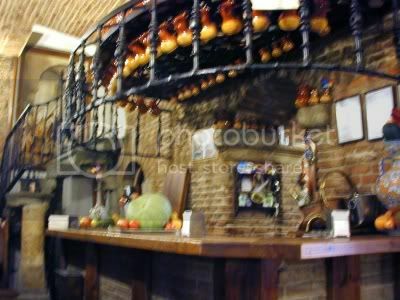 The overhang above the bar was made to look like wooden beer barrels separated by wooden mugs. The mugs were actually light fixtures. Just one beer spigot and shelves of liquor behind the bar. An old, but good sized, sound mixing board was next to the window and there were a couple of CD players. The place didn’t look like it could hold more than a dozen people but who knows. There was a set of stairs heading down to somewhere so maybe they had a lounge down there or something. I had a San Miguel. A small corner place that was narrow but fairly deep. The metal topped bar could accommodate at least a dozen black metal bar chairs but most had been pulled over to the small round tables against the windows where people seemed to prefer to have their drinks. The front of the bar was a combination of wood, black marble, and white ceramic tiles with brown circle and star designs. Round globe lights hung over the bar. A cupboard behind the bar held the liquor, an espresso machine, and a refrigerator with a glass door that held the beer and wine. There were three copper colored beer spigots on the bar. City scenes painted by local artists adorned the walls. The wall opposite the bar with the windows was white stucco on top and kind of a light and dark brown patterned tile below. 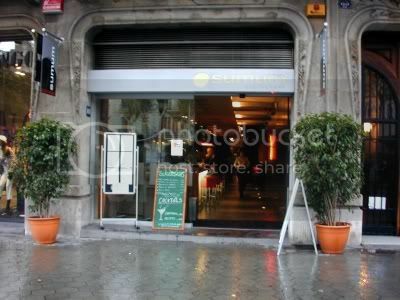 To the left of the bar, next to the door, is a large window and a cooler with ice-cream treats. The walls in the back are covered with kind of a carmel swirled patterned paneling. There is a television in the back that was showing indoor soccer. There was a large aquarium in the back and when I checked it out I saw that it held a large boa constrictor. There were also photographs of some kind of an acrobatic team on the walls in the back. 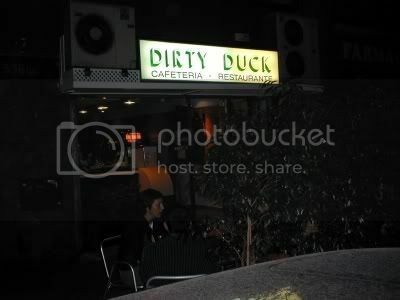 This is where we had dinner. I was late getting back to Paddy’s Lane so my punishment was that I could not linger at the bar here before dinner. All I can tell you is that it was a fancy place with a nice wooden bar and lights with large white shades hanging over it. I was going to take more notes on the way out but kind of lost focus and forgot. Bar Man is falling down on the job. I had a quick glass of red wine and then headed to the back for dinner. Five bars for the day making 867 for the year and leaving 133 to go. I just need eight more in Spain to hit 875 for the year. I might exceed that although one day I will be spending a bit of time on the train back to Madrid and then only one more day in Madrid before heading home.